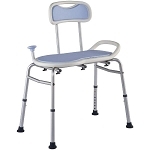 Padded seat and back provides increased comfort for users with arthritis who have difficulty getting in and out of the bathtub. Personal transporter for those with limited mobility due to arthritis. Deluxe personal transporter for those who need help walking. 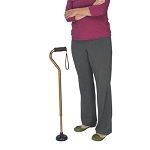 Easy to use, lightweight rollator for people who need help walking. Soft-textured, contoured handle is comfortable to grip, even when wet. SImple, elegant long handle tool helpful for people with limited reach. Elegant, dignified long handle tool for people who have difficulty reaching.